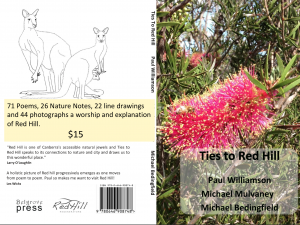 You are cordially invited to the launch of the second book of poetry by Paul Williamson, titled ‘Ties to Red Hill’, at 4pm on Tuesday 4 December 2018 at the Red Hill Summit cafe (see invitation). Copies of this book can be purchased and will be signed by the author at the launch, or orders should be sent to mulvaney@netspeed.com.au and include your name, postal address, phone number and email address. A few remaining copies of Paul’s first book ‘Moments from Red Hill’ will also be available for purchase. By redhillregenerators in News (2018) on 11 November, 2018 .